Retired Gen. Charles Krulak, the Marine Corps’ 31st commandant, has endorsed Congressman Walter Jones in the Republican primary in eastern North Carolina. One of the Marine Corps’ biggest advocates in Congress is facing a tough re-election fight, and a former commandant has lent his name to the campaign with hopes it will swing some votes in a district teeming with active-duty Marines and veterans. 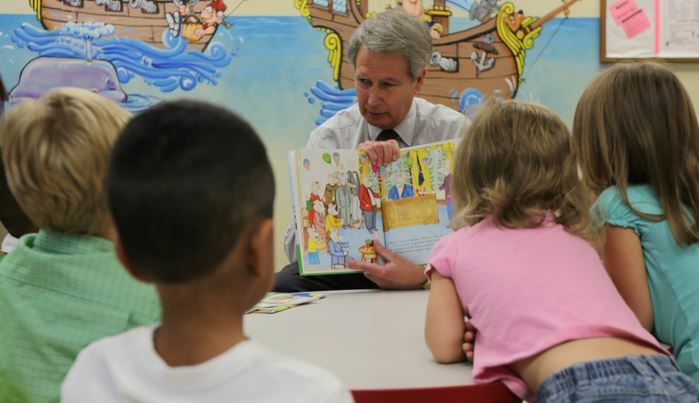 Voters in eastern North Carolina head to the polls Tuesday to determine whether Republican Rep. Walter Jones survives what’s been a heated primary contest with challenger Taylor Griffin, who worked for the Treasury Department during George W. Bush’s tenure in the White House. The race has generated significant buzz beyond North Carolina thanks to Griffin’s powerful connections, including to former vice presidential nominee Sarah Palin, who’ve either offered their endorsement or infused his campaign with cash. Slate.com published this long-form feature on Griffin just last week. In Jones’ corner is retired Gen. Charles Krulak, the Marine Corps’ 31st commandant. Both are household names in North Carolina’s 3rd congressional district, which includes Camp Lejeune and the Marine Corps air stations at New River and Cherry Point. Jones has held that seat since 1995, just as Krulak was starting his four-year tenure as the top Marine. I checked in with Krulak on Monday after reading a brief commentary he wrote on the congressman’s behalf for a host of local newspapers, including The Daily News of Jacksonville, N.C. It piqued my interest for several reasons, not the least of which is my own connection to that part of the country. Before moving to Washington, where Marine Corps Times is based, I spent a little less than two years working at The Daily News and in that time reported regularly on the Marine Corps and Congressman Jones. More recently, of course, I’ve reported on Jones’ fierce criticism of the current commandant, Gen. Jim Amos, and his defense of Maj. James Weirick, the Marine attorney turned whistleblower who accused Amos and others of abusing their authority and then exacting revenge for having done so. As a result, Walter Jones does not exactly poll well in the commandant’s office. I had to know why Krulak went to bat for him. That was a recurring theme throughout our conversation. Krulak explained that it’s not merely Jones’ support for big-ticket acquisition projects that makes him “no better friend” to the Marine Corps. It’s his support for the troops’ personal safety and their well being, he said. In other words, Krulak supports Jones because Jones supports individual Marines. Indeed, he’s got a strong track record of doing just that. For instance, when I was city editor at The Daily News in 2004 and 2005, Jones threw down when the Marine Corps sought to prosecute 2nd Lt. Ilario Pantano for the deaths of two Iraqi men. Amos was the commanding general of Pantano’s parent command at that time. Before that, Jones took up the cause of two MV-22 Osprey pilots who were at the controls when their aircraft crashed in Arizona in 2000, killing them and 17 other Marines. He has lobbied the Marine Corps to update its official records — so far to no avail — so that they clearly indicate the pilots were not to blame for the incident. I’ve spoken to Jones numerous times over the years, and almost every conversation comes back to this cause of his. Amos, the first aviator to become commandant, was intimately involved with the Osprey’s development and as a one-star general came under heavy scrutiny during its early troubles. It’s unclear why he hasn’t addressed Jones’ request — though certainly it’s not for a lack of effort, nor for lack of support. Is it bad blood? I think that’s a fair question, and it compelled me to ask Krulak this: Given that many within HQMC view Walter Jones as a troublemaker, are you concerned with how your endorsement may be viewed by Gen. Amos? Jones’ issues with Amos “have been played out in the media,” Krulak continued. I braced for what I expected to come next: a polite but pointed swipe at the muckraking Marine Corps Times and my fellow travelers in the mainstream press. But no. The general’s view is decidedly more progressive than that. Krulak recounted a number of difficult situations he weathered as commandant, including a training mishap in the Italian Alps that left 20 civilians dead and an infamous hazing case at Camp Lejeune. Much has been made of Marine Corps Times’ reporting over the past year as we’ve endeavored to explain and make sense of the incredibly serious allegations Maj. Weirick and Congressman Jones have brought to light. Obviously, it’s won us few friends at Marine Corps headquarters. But we put our belief in transparency above all of that. It’s certainly encouraging to learn we’re not alone in embracing such ideals. Gen Krulak’s stock is way up on the Bracknell index. Honor. Commitment. Integrity. Three words that sum up Gen Krulak. Also, he apparently understands the purpose of a free and independent media…Ditto what Butch B. said – Gen Krulak’s stock is now through the roof. Krulak for President (only as a Republican, of course)!!! is there anyway I can get a copy of the photo of all the General’s together. James Marbut: You can download it here http://www.marines.mil/Photos.aspx?igphoto=2000792263 Also, since it’s an official photo, there’s likely a way to get a copy through the Marine Corps website. Way to go General! You show what the true value of The Corps means! All in the district need to turn out and VOTE for Jones! He has proven this past year that he is one of the FEW that have actually stood up for the troops and not the brass! Grab a buddy and VOTE! 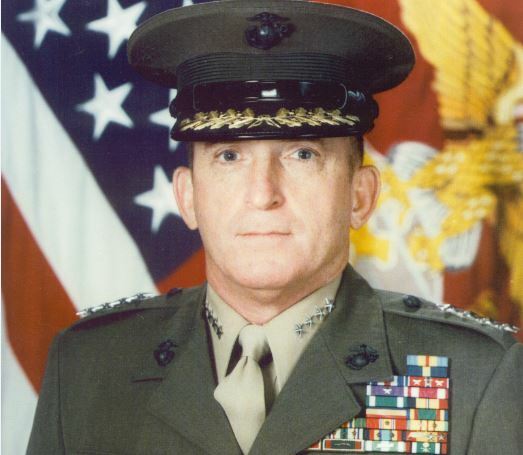 I met General Krulak when he was CGFMFPAC, and he had just been nominated by President Clinton to become Commandant. He was touring bases and had a function at the O-Club at MCAS Iwakuni, where I worked. The officers were having a hell of a party for him and I was quietly working behind a cash register when he came out of the head. He saw me all alone, and then just came over and struck up a conversation. I snapped to attention, but he waved me off and told me to relax. He spent about 10 minutes just chatting with me before some colonels came to get him. It was very cool and I have a lot of respect for him. The photo is awesome and thanks to the Marine Corps Times for sharing. The issues surrounding Gen Amos’ handling of the sniper incident are subject matter that we all have personal opinions about…as it should be. The Marine Corps Times has done a really good job reporting on the story. However, I really would have preferred to see this picture not presented in the context of the sniper issue or in context of a political endorsement by a retired general who, some might say, has swung at some his own sanctimonious windmills. My sister and I enjoy posting to your website. Your site offers tons of great debates! Awesome! 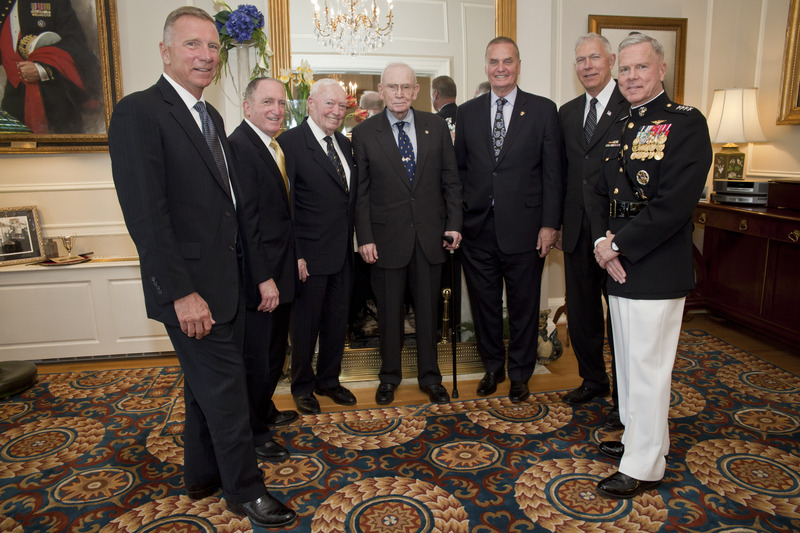 My experience with General Krulak is one that I will never forget. I was a Cpl in 1996. I was the Cpl that asked the General why female Drill Instructors didn’t rate the infamous “Smokey the Bear” Campaign Cover when they completed D.I. School. This was back when he had the “Marine Mail” initiative. General Krulak made me feel like an NCO should feel. Like they can make a difference simply by stepping up and asking or doing things that someone else may be afraid to do. He personally emailed me. To this day, I have those emails. Next thing I knew, there was an ALMAR on the message board authorizing female Drill Instructors to wear the campaign cover. The way he made me feel, the impact he had on me as an NCO of Marines was the driving force behind my entire career. The impression he had on me is why my focus is solely on NCO’s and making sure that they know they are the future of the Marine Corps and ensuring that they understand the power that they have. Today, I am an Officer in the Marine Corps. This goes to show that Marines’ lives are driven by the smallest encouraging word, the time you take, no matter what rank you are, to just talk to Marines. When you walk past a Marine and say “how are you?’ Mean it. Take the time to stop and listen to how they are doing. They are important, they make a difference and they matter. Thank you General Krulak for having a huge impact on my life. I love your site, thanks for keeping the website up to date. I really love your website, I hope your site continues to grow. My sister and I love to post on your website. Your blog offers tons of great controversial conversations! I had the same qustion about your written in the blog.i think i get my results.thanks.